Ebrahimi Advanced Simulation Company has been established in (1999/05/23), and its main activity is in the field of Simulation and Training Devices. High quality and low cost training improves safety of the operators and users of the High Tech vehicles and equipments. 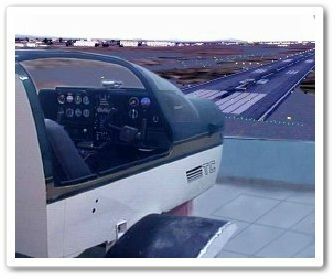 Simulators are used to simulate sophisticated and expensive devices such as airplanes, Trains and Ships and they are used for personnel training. Ebrahimi Advanced Simulation is ready to have international cooperation in the field of Simulation in the form of Joint Venture and Technology Transfer for producing simulators for new customers. Please contact us for further information. Airbus 320 simulator.More information here. Fokker 100 simulator is ready for sale to airlines and flight schools.More information here. 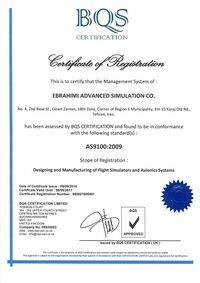 has received its AS9100:2009 certificate from BQS International for designing and manufacturing of flight simulators and avionics system. AS9100 is a widely adopted and standardized quality management system for the aerospace industry. Major aerospace manufacturers and suppliers worldwide require compliance and/or registration to AS9100 as a condition of doing business with them.